There is a short demo option with Livestream Studio that allows you to try the software prior to purchasing. Download and install Livestream Studio. When the installation is complete, the software will launch and you will see the following screen. 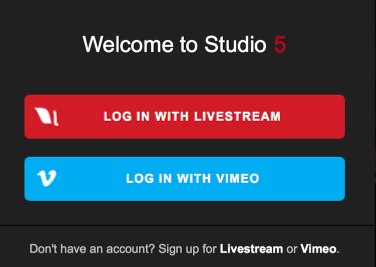 A demo of Studio is available by signing up for Vimeo. Signing up for Vimeo gives you access to a 10-minute live demo. This means you have full access to Livestream Studio and may broadcast for a total of 10 minutes before the demo expires. 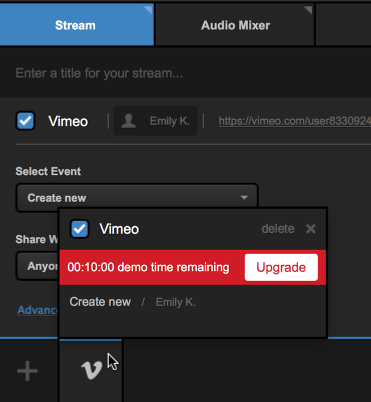 A countdown of your demo time remaining will appear when you navigate to the Stream tab and hover the cursor over the Vimeo icon at the bottom of the interface. All video recordings and outputs will include a watermark during this demo period. Your demo will expire after you have streamed for a total of 10 minutes. To continue using Livestream Studio when your demo expires, you will need to purchase a subscription. What is Studio Web Control?